About the Ecole Supérieure Robert de Sorbon® for students not familiar with the French system of higher education. Are you a French Institution Institution of Higher Education? 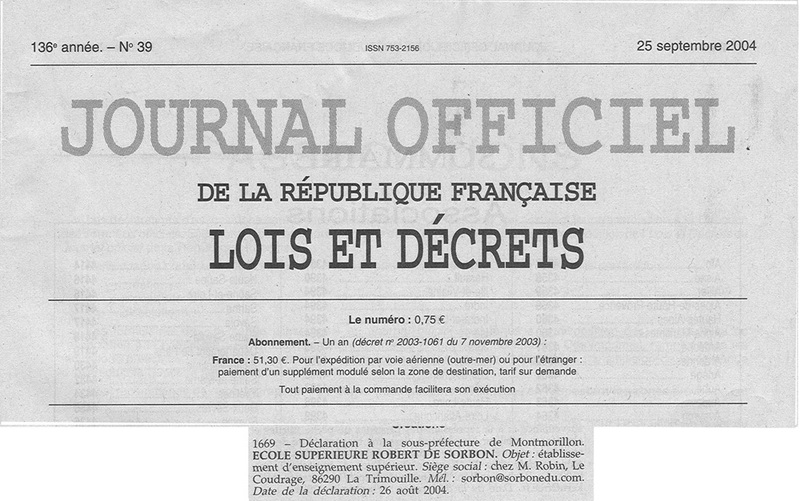 Yes, the Ecole Supérieure Robert de Sorbon® is authorized to operate under the article L731-1 and L731-6 of the code de l'éducation de la République Française. It is registered by the French Government under # 0862003720 with publication at the Journal Officiel of the French Republic (# 1669 of # 39 - 136 année). It is authorized to grant degrees as per L 731-14. It has a SIRET and SIREN number and is tax (VAT) exempt as an "Etablissement d'Enseignement Supérieur". 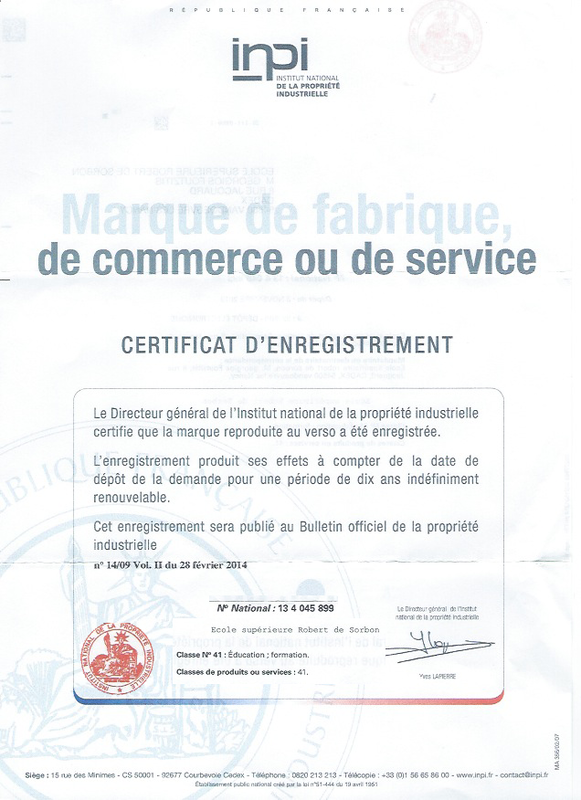 It is registered French not for profit, private institution of higher education. It is a participating member of the United Nations PRME (Principles of for Responsible Management Education) initiated by his excellency Ben Kee-moon general secretary of the United Nations. It is referenced by the Official Directory of Private Education, Formatissio Universités et Facultés, Directory of Education, Braintrasck University Index DOCEOS.and the Worlwide University Directory. We are proud to be mentioned in the Larousse Dictionary. and the "Gros Robert". Is the VAE Law (Validation des Acquis de l'Expérience) procedure legal in France? Absolutely, it is a Law been signed by the French "Premier Ministre" on January 17, 2002. and it regulates the VAE procedure. The VAE allows public universities to grant full degrees on experience, exactly similar to the "classic ones". They bear the same name and could not be discriminated. We follow the same procedure than the ones generally used by the public universities. It is our experience that many US and foreign universities universities now recognize VAE based degrees. The Ecole Supérieure Robert de Sorbon® is a legal French Private Institution of Higher Education following the "Code de l'Education de la République Francaise". It has the right to grant degrees as per article L-731-14 of the French code of education. 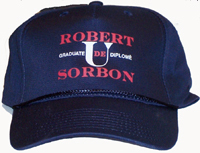 The école supérieure Robert de Sorbon® is not a US or Canadian accredited university, but a French registered private institution of higher education authorized to grant degrees (art L 731 of the French Code of Education). In the USA, your French degree should be, like all foreign ones, evaluated by a credentialing agency for university admissions, jobs or immigration. We will provide you with names of many (9+) US Credential Evaluation Services that generally recognizes our French degrees as equivalent to US regionally accredited ones. Do you have a .education domain name? Yes ICANN granted us the www.sorbon.education domain. Being a French institution of Higher Education, we are proud that the French authorities (AFNIC) granted us the prestiguious www.sorbon.fr domain in 2004.
Who are your professors and are they qualified? Judge by yourself see their Ph.D. degrees and unique University teaching experience. Click to see the quality of the report of one of our VAE jury member. Are your degrees accepted by other universities? "I received my diploma and I am happy...thank you, thank you the Dean of the university is satisfied, the administration is certain to pass well the accreditation... My evaluations were excellent, now there is the degree in French language. I will be able to change my title of "Visiting Professor" to "Associate Professor". I would like now to continue with you to obtain a doctorate..."
What documents should I provide for the VAE? a) Proof through third parties, certificate of employment, affidavit, articles, publication etc. of your work experience. A qualitative and quantitative job description should be included. The goal is to assess independently and fairly your career. b) Copies of your degrees and transcripts of your previous studies (if any) from an acceptable university. Will I have transcripts for my studies? -Degree in French (By Law there is no mention of the VAE procedure). -UNESCO--CEPES Diploma Supplement in English as agreed by the Conseil de l'Europe (EUROPASS). It may indicate the UNESCO - International Standard Classification of Education (ISCED) code (4 to 6). May I see a copy of your diplomas? 1) You are not buying a diploma but a registered French institution of Higher Education may bestow upon you a degree according to the French code of education and its own internal procedure. 2) No genuine university, for security reasons will give you sample of their official documents. We must add that France Institutions of Higher education are notorious for their "below average looking diplomas" and do not organize graduation ceremonies.- commencements. The value of a degree is important, not the look of its diploma. Remember the phrase of the French poet Alfred de Musset (1810-1857) "Qu'importe le flacon du moment qu'on a l'ivresse"
Could I get a de Sorbon Gown when I graduate? Yes you can. 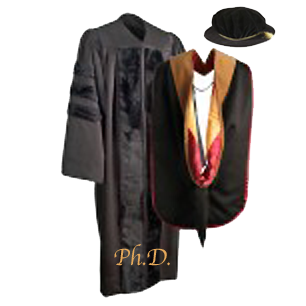 Contrary to other French universities, de Sorbon rehabilitates the formal and traditional University gowns, called "Robes de Cérémonie". You may order it after graduation at the Sorbon boutique. Could I get two degrees from you at the same time? Forget for a moment your own system of education and think "French". The VAE recognizes work experience associated or not with previous studies as equivalent to a certain educational level. Therefore it forbids us to give two degrees at the same time. As we are a not for profit organization (loi de 1901) we recommend that you apply, according to the rules mentioned in our pages, to the highest degree possible. If you insist for two consecutive degrees, we will have to charge you twice. Should I take additional courses to receive a French Diploma? It depends, but the VAE authorizes to grant "Certificats" entirely based on experience. From the "equivalence formula" located at www.sorbon.fr/diplomeengl.html you can foresee your possible educational level. I need a letter of invitation to enter France, could I get one from your institution? Absolutely not. We are a registered French university specialized in the VAE procedure not a way to circumvent French and European immigration laws. Could I request a specific GPA or impose a specific name or level? Certainly not ! Our "Jurys de VAE" are independent and sovereign. You may earn a degree from a French Private Institution of Higher Education, you are not buying a piece of paper with no value. In the case of the VAE, there will be no GPA or Grades as we use the Pass/Fail system. Please understand that we are in the French system of higher education with strict rules, different from your system. However, through our detailed UNESCO-CEPES Diploma Supplement in English, your French degree may be evaluated as equivalent to a US accredited one by US credential evaluators and by the countries of the Lisbon Treaty on higher education. If I am accepted and if I pay the Jury and diploma fees, am I sure to get the "requested" Diploma? No. Like in all Universities, you are never assured of the results of an examination. However the admission committee will verify that you qualify for the VAE specially in determining that you have the sufficient number of years of work experience for the applied degree. Then, our VAE jury will only appreciate the quality of the work experience. Could I have a backdated diploma? No! it is fraudulent to backdate a French degree! Can I get my degree tomorrow? No (non!) We are not a "Diploma Mill" and we follow a regulated evaluation procedure, which takes up to 3 months. I am a De Sorbon® Alumni and I want to apply for another VAE. What should I do? Could I have a copy of my de Sorbon Diploma? Unfortunately because of the French regulations and of the French University tradition, NO COPY OF THE ORIGINAL WILL BE ISSUED for any reason. However our registrar office may deliver an "attestation de succès" i.e. a letter confirming the degree, if needed. France is known to have a high productivity despite numerous holidays (35 hours/week, 5 week holidays)... Our institution follows also the traditional French University breaks. However contrary to many, we do not close our institution during the summer. Our main closing periods are: Christmas New Year, February Holidays, Easter-Pâques Recess, End of the Academic Year exams (May), Bastille Day 14 Th. of July, August 15, French Armistice day (November 11). The application fee is refundable, if you are not admitted into Robert de Sorbon you will be refunded less the credit card fees. After admission, the tuition is due and, like all university, tuition is not refundable. Have you an Alumni Association? 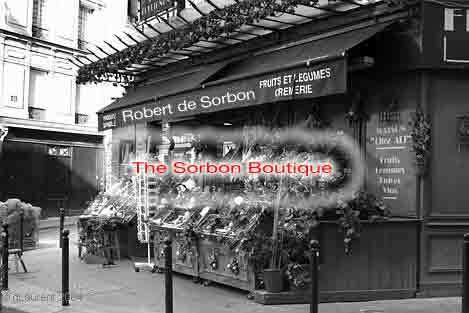 Have you a shop selling de Sorbon® memorabilia (Gowns Cap, Stickers T-Shirts)?